Short ribs cost a fortune around here, but hey, who’s better than you? YOLO!! This preparation is an L Stockton special, and is quite good. Heat oven to 275°. Season ribs with salt and pepper. Heat oil in dutch oven. Sear ribs on all sides 1-2 minutes per side. Do in batches if necessary to avoid crowding. Set aside. Drain all but 1 ½ Tbsp oil. Add onion, celery, carrots, garlic, bay leaf, thyme, and rosemary; sauté 3-4 minutes. Add stock and wine. Return ribs back to pot. Liquid should come at least halfway up side of ribs. Bring to a boil. Cover, place in oven and bake for 3 hours, flipping ribs halfway through to ensure an even braise. 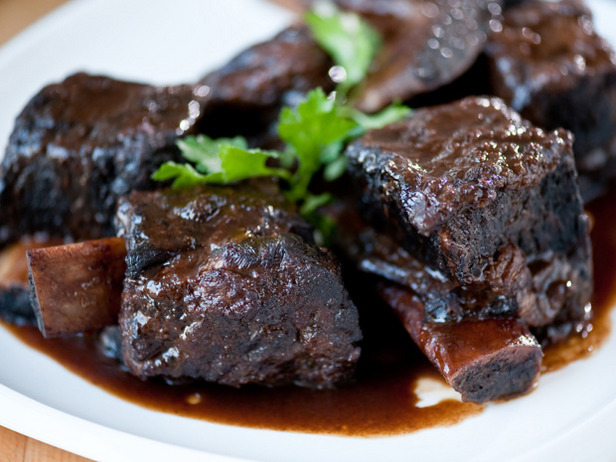 Place short ribs on broiler rack or in skillet and brown to remove fat; drain well. 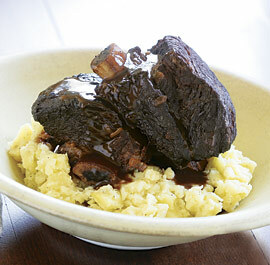 Combine 1/2 cup flour with the paprika, salt and dry mustard; toss with short ribs. Place remaining ingredients except 2 Tbsps flour and the water in slow cooker; stir to mix ribs with onion rings (be sure onions are under ribs – not on top). Cover and cook on Low for 8 – 12 hours or on High for 4 – 6 hrs. Remove short ribs to warm serving platter. If thickened gravy is desired, make a smooth paste of flour and water. Turn slow-cooker to High and stir in paste. Cover and cook until gravy is thickened.